The King's Lynn Maritime Trail01553 763044work Guided WalkA brand new, self-guided walking tour focusing on King's Lynn's maritime heritage was launched on International Hanse Day 2013. 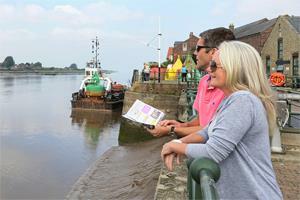 The Maritime Trail guides people through King's Lynn's exceptional historic built environment. By incorporating the stories of the merchants, shipbuilders, sailors, fishermen, press gangs, porters and pubs, which have played key roles in the town's history, the trail helps to bring the past to life. The way-marked trail, which starts at True's Yard Fisherfolk Museum and ends at Marriott's Warehouse, features 27 bronze pavement plaques. There are four different designs to look out for, representing the four wards through which the trail passes. North End Ward - portrayed by a ship's anchor - tours the historic home of King's Lynn's fishing community at True's Yard, as well as taking in St Nicholas' Chapel, Common Staithe Quay, and the impressive Tuesday Market Place. Trinity Ward - represented by a Kogge or merchant's ship - covers King's Staithe Square, the Bank House and the impressive merchant's mansion and tower - Clifton House. The area was a key place for merchants to conduct their business in the 17th and 18th centuries. Chequer Ward - depicted by a compass - takes in the iconic Custom House and the magnificent buildings on King Street, behind which was a world of warehouses, breweries and merchants' yards. Stonegate Ward - signified by the image of a whale - takes in locations such as Nelson Street, Greenland Fishery, Hanse House and Marriott's Warehouse, and reflects the oldest part of the town, from which King's Lynn developed to become one of England's major ports. A brand new, self-guided walking tour focusing on King's Lynn's maritime heritage was launched on International Hanse Day 2013. Maritime Trail guide booklets will be available from King's Lynn Tourist Information Centre, True's Yard Fisherfolk Museum and Marriott's Warehouse at a cost of just 50p. The trail takes a minimum of around 1.5 hours to complete, but can be considerably longer depending on the amount of time taken to explore the various locations along the trail. Maritime Trail guides are 50p each from Trues Yard Fisherfolk Museum, King's Lynn Tourist Information Centre, and other participating venues.